Eurocom launches the 15.6” Sky X4E2 fully upgradeable, high performance laptop with NVIDIA GeForce GTX 1070 or 1060 MXM graphics, powerful Skylake Intel Core i7-6700K Desktop Processor, up to 64GB of DDR4 3000MHz memory and up to 6TB of RAID 0/1 storage with four drives including two NVMe based M.2 SSDs. The EUROCOM Sky X4E2 is designed as a high performance, highly mobile powerhouse platform that is fully upgradeable and configurable with a rock solid chassis for on the go use for students, gamers or professionals. Have reliable internet on the go with the prewired 3G/4G/LTE module support in the Sky X4E2. Equipped with a fully unlocked LGA1151 socket based Intel i7 6700K or 6600K Skylake Processor, users won’t have any trouble running demanding games, simulations and intense workloads with this pocket rocket! Armed with your choice of modular and upgradeable MXM 3.0 NVIDIA GeForce GTX 1060 or 1070 desktop graphics cards, users will be able to perform heavy-duty rendering and run the latest games on high settings. NVIDIA GeForce 10 series MXM 3 graphics are supported in the Sky X4E2 for high performance graphics capability in a 15.6” chassis. When equipped with the quad core Intel Core i7-6700K unlocked processor, via LGA 1151 socket and Intel Z170 chipset integration, running at up to 4.2 GHz with 8MB of SmartCache, the Sky X4E2 delivers class-leading multi-tasking and multi-threaded performance. 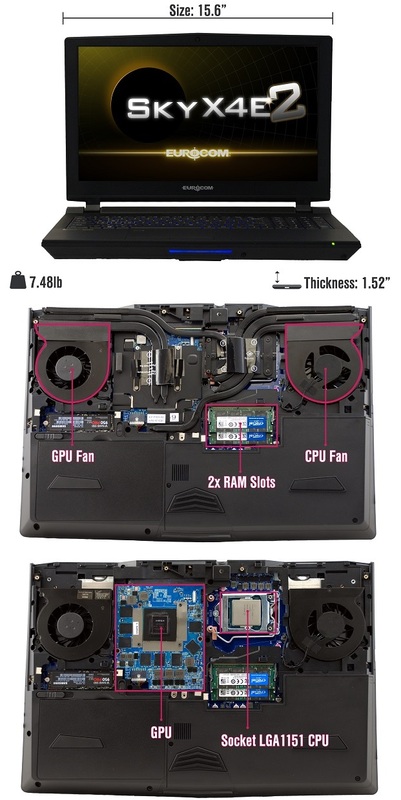 The EUROCOM Sky X4E2, like all new Eurocom systems, is equipped with a user friendly Overclocking Center to get the most out of your high performance laptop by modifying the Core and Memory increment for the GPU and CPU ratio override, cache Ratio and power limits. Intel XTU (Extreme Tuning Utility) support is enabled on the Sky X4E2 platform, allowing enthusiasts to push the limits of their hardware. XTU allows users to adjust CPU and system clocks, as well as monitor the system for stability. Unlocked CPUs such as the i7-6700k can be overclocked through multiplier adjustment. Despite this little guy’s form factor, we haven’t compromised on your choice of 15.6-inch, IPS display options. You can choose from a FullHD, G-SYNC panel or an UltraHD 4K display for your preferences. The Sky X4E2 has four 260pin SODIMM 1.2V memory slots and supports up to 64GB DDR4 3000MHz, creating a flexible tool for virtualization, gaming and high performance computing. Users have a wide selection of memory options, starting from 8 GB all the way up to 64 GB of DDR4 RAM! In the storage department, we offer room for up to 4 physical storage drives (two M.2 slots and two 2.5 inch bays), for a maximum storage capacity of up to 6 TB! Further, your data will be protected with a Kensington lock, biometric security, and Trusted Platform Module (TPM) data encryption. TPM encrypts all your data so only you have access to it, even if your machine is misplaced or stolen.